The great thing about August is that the weather is usually wonderful. There may be only a month left in the official 2017 summer, but that doesn’t mean there isn’t lots of warm weather to be enjoyed! So instead of bemoaning the date, perhaps we should be putting some effort into celebrating it. It’s not hard! The farmers markets and supermarkets are literally bursting with berries and fresh fruit. Combined with our flavourful fruit wines, not only cocktails and sangrias, but Summer Desserts are a breeze to make and to serve up in the hot day days ahead. Everyone loves them and they can be so much fun! Take 1 cup of each and blend together in a blender. Add the remainder of the berries and cover with Field Stone Raspberry Dessert Wine. Refrigerate for a couple of hours. Pour over anything. Yum! 2) Summer Berry and Fruit Compote. Combine blueberries, sugar, wine, lemon juice and lemon peel in a saucepan. Bring to boil over medium heat. Reduce heat and simmer, stirring occasionally, for 15-20 minutes or until mixture is slightly thickened. Remove from heat and stir in vanilla. Cool to room temperatures. Cover & refrigerate for at least 2 hours or up to 24 hours. Combine strawberries, blackberries and peaches. Spoon strawberry mixture into 6 serving dishes. Spoon blueberry mixture over top. Serves 6. 3) Berry Cherry Wine Slushie. Blend together, pour into glasses and serve immediately! Put all ingredients in food processor. Process till smooth. Add the lime juice. Pour into a 9’ baking pan, freeze uncovered. After two hours, break up with a fork. In five hours it should be frozen to a good consistency. When firm and solid, scrape up with a fork or spoon and serve in martini or parfait glasses. 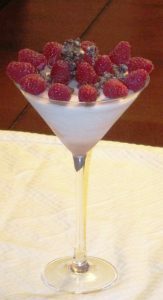 5) Field Stone Strawberry Cream Trifle. Place cheese in blender and blend til smooth. Blend in cream, strawberries, preserves and wine. Chill at least 2 hours or up to 8 hours. Garnish with sliced strawberries and/or mint leaves. 7) Black Currant Wine Sorbet. Cook first 3 ingredients and 1 cup water in a small saucepan over medium heat, stirring occasionally, 3 minutes or just until sugar dissolves. Fill a large bowl with ice; place saucepan in ice, and let stand, stirring wine mixture occasionally, until cold (about 1 hour). Pour mixture into freezer container of a 1 1/2-qt. electric ice-cream maker; freeze according to manufacturer’s instructions. (Instructions and times will vary.) Spoon sorbet into an airtight container; cover and freeze at least 8 hours. Combine blackberries and next 5 ingredients; toss gently. Cover and chill up to 2 hours. Serve sorbet topped with berries. Gently combine raspberries with ½ cup of the wine. Beat together melted chocolate, cream cheese and honey til fluffy. Beat in 3 Tbsp. raspberry wine, crème de cacao and vanilla until blended. Spoon raspberry mixture evenly into 8 small dishes. Top each each serving with mousse. Garnish with chocolate curls and refrigerate for up to one day before serving. Divide sorbet into two glasses (stemmed look great). Pour two ounces of Raspberry Fruit Wine over each. Garnish with some raspberries on a skewer. If you like it a little sparklier, top with champagne! 10) Field Stone Super Summer Swirl Dessert. Soften the ice cream and put in into the blender with the dessert wine. Blend. Pour into martini glasses and re-freeze. Top with fresh berries and a grating of chocolate. Yum! You can also try: Strawberry Dessert Wine with strawberries; Saskatoon Berry Dessert Wine with saskatoons; or Black Currant Dessert Wine with blueberries or blackberries. Added tip: If you are making the Saskatoon Berry, look for Co-op’s Saskatoon Berry Ice Cream to use in the recipe. It adds great flavour! We hope this helps you enjoy the fruit season! You can find more recipes at our website anytime, or on our Pinterest site. As you probably already know, we’d love to hear from you if you have a developed a dessert recipe using our fruit wines. Most of our recipes have come from customers who have combined their great imaginations with our products. In other news, we have just finished picking our saskatoon berry crop for this year and have managed to secure 12,500 pounds of the lovely little purple fruit. They are now off to the freezer to be brought back at a later date and transformed into a delicious fruit or dessert wine. Our early “Chief” raspberries are also in the freezer, along with the “Kent” strawberries. But more fun ahead: our “Double-Delight Raspberries” and our “Seascape Strawberries” are looking good for a September harvest. Thankfully our trusty red strobe light in the strawberry patch has kept the resident deer families at bay this summer. And thanks to everyone who has inquired about our ongoing competition with Mother Nature. A big shout-out this month to all our customers who’ve come to visit us at the seasonal farmers markets. July was a banner month! A huge thank you to our Edmonton customers who have supported us bigtime in our first foray into the Edmonton farmers market scene. You can find us every Saturday and Sunday at the South Common Farmers Market, near Ikea. And for a list of our weekly markets, check out our market page. Most markets will continue well into September and some into October. If you live in the Red Deer, Calgary or Edmonton areas, you can find us this summer at a market near you. And for all who have asked, the answer is “Yes, we will be returning to the Medicine Hat Farmers Market” on Saturdays come September. Stay tuned to our Facebook page for exact dates and the details. And one big event to mention for all ‘market-goers.’ The 110th Annual Priddis Millarville Fair is coming up on August 19th at the Millarville Race Track, southwest of Calgary. Hours will be 9 to 4pm. A fabulous day event for the whole family, you may not want to miss this. For more information, visit them here. See you there! Finally, since it’s “Throwback Thursday” in social media land today, I’ll leave you with a little throwback of us mixing summer sangrias on GlobalTV news on August 3rd, 2014. You can find it here. Those sangrias are just as yummy this year… We hope you try some. And, that’s it for this month. We hope you enjoy the last half of the super summer season and your patio-perfect moments include fruit wines! Happy August, everyone. Bring on the dessert.